How are we to understand that the original guru of our sampradaya becomes bewildered?1 It is “impossible.” We must suspend our “knowledge” (jnane prayasam udapasya namanta eva). 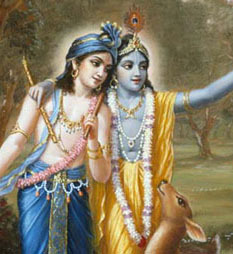 We may take it that Krishna is playing hide and seek, perhaps, with Brahma, our gurudeva. It is like a game of hide and seek. Sometimes Krishna is defeating others and sometimes he is defeated. Sridhara Maharaja is here reffering to the Brahma-vimohan lila, wherein Brahma, in some ways the original founder of the Gaudiya sampradaya, becomes bewildered about Krishna’s position.